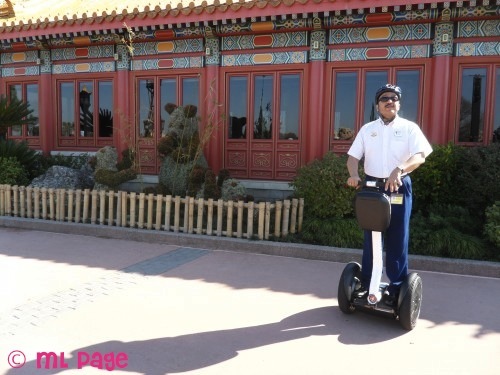 During my February 2011 trip to Walt Disney World I was able to experience the Segway Tour of World Showcase. This 3 hour tour gives you a rare glimpse at World Showcase from the view of an amazing machine. I will try to make my descriptions brief to avoid spoilers but let me just say- this was a great experience because of the amazing people and wonderfully organized nature of this tour. I knew we were going to have an amazing time when one of our guides (whom I may have been trying to sweet talk into letting my husband run over to The Land to fast pass Soarin’ for us) gave us a No Strings Attached Fast Pass that could be used anywhere in the park that day! 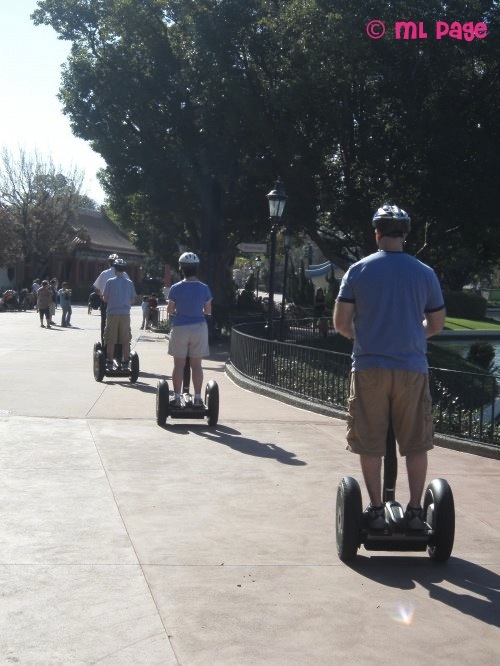 The first 20 minutes of your tour go to farmiliarizing yourself with the Segway. Your group will be walked from the guest services building over to Innoventions where you first learn the logistics by watching a short video and hearing from your instructor. Then, you suit up, choosing a helmet and packing your items in your transport. 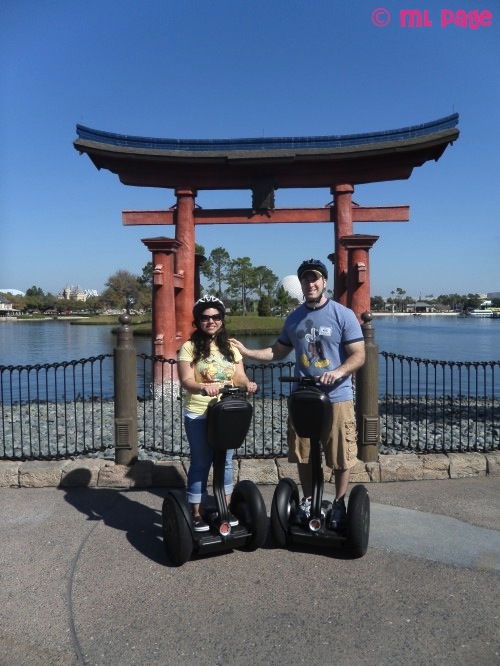 After some training (I will admit I was not immediately adept at driving my Segway but it was very easy to learn and I now tell my husband on a daily basis how we should move closer to my job and I should ride one to work), you are ready for your adventure. 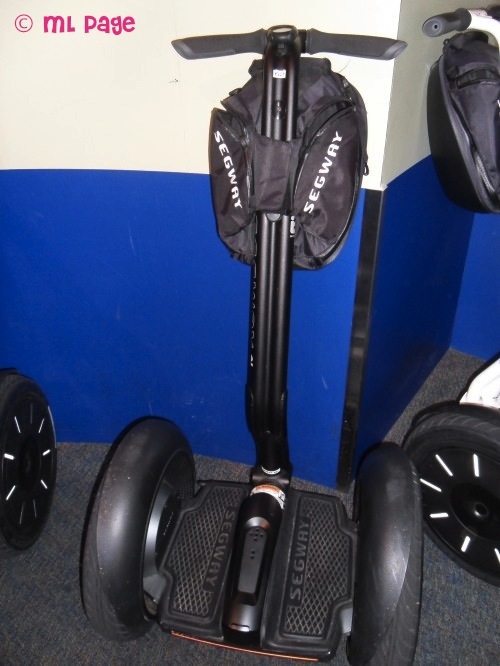 You will have learned how to manuver your Segway and how to go up and down hill, stop, reverse, and go forward. You will then put your knowledge to the test on an uninhabited tour of World Showcase. I may be biased because I teach World History for a living but this part of the park is so beautiful and getting to ride around it when it was not even open to the public yet was breathtaking! You learn hand signals and ride in a single file line from country to country, stopping for some fun facts and history (and trivia) along the way. I will not include any spoilers here- just say that I was most impressed by what I learned in Morraco. After you have completely made your way through the 11 country pavilions you return to Innoventions where you disembark and say goodbye (complete with a commemorative pin)! We were lucky enough to get over an hour and a half in the World Showcase on our tour and it seems the normal is between an hour and fifteen minutes and that. I high recommend this tour- so much so that I would go back and do it again in a heartbeat! I would highly recommend choosing one of the earlier times. Most days World Showcase opens at 11 so as long as you get into at least the 9:30am tour you should not have to deal with crowded streets. Also, I believe the tour has recently changed to include a small snack and beverages- check with a castmember when booking or your Disney Travel Agent for details!